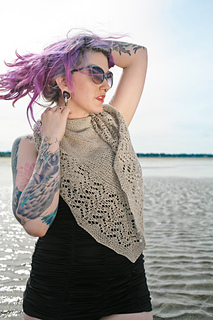 Two sizes: The heart shaped triangle (sand coloured) has a 68" wingspan and a 32" deep triangle. The regular triangle shaped (red coloured) has a 73" wingspan and a 38" deep triangle. 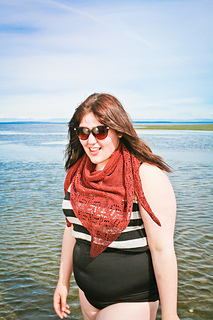 Knit this at the beach. No seriously do it. 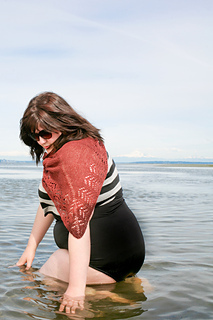 This shawl has been designed in two shapes. heart shape triangle and a regular triangle version. 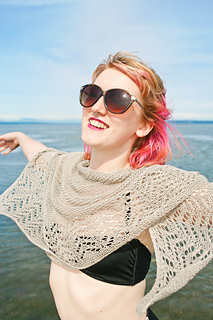 Salt Water is a light, cool, drap-y shawl designed specifically for beach knitting and wearing. It’s cool to the touch and protects shoulders from getting too toasted in the summer sun. 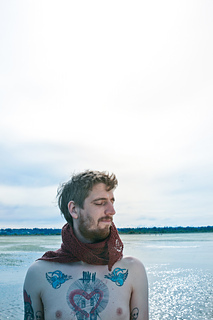 It also provides some warmth from those windy beach days. It’s designed to use linen or other plant based fibres. But has been knit up and looks pretty good in wool too. 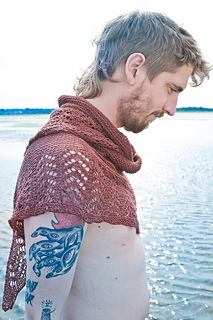 This shawl is designed to be quite adjustable. You can make it bigger or smaller, with less garter and more lace or vice versa. Thank you to the amazing Caitlin, and her husbeast Arlin, and woolcamera for modelling! Thank you to annahunter for sample knitting the red version for me! As with any of my paid patterns, please feel free to contact me if you are low on funds. I am happy to gift you a copy of the pattern free of charge.